City has welcomed a prestigious delegation of visitors from the Chinese Embassy. 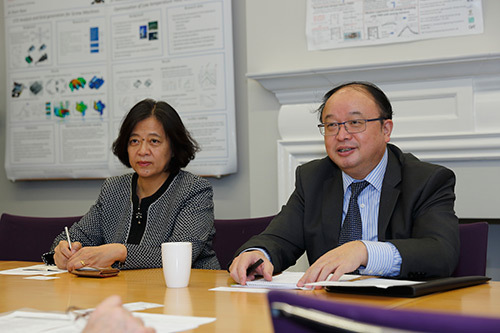 Mr Shen Yang, Minister Counsellor of Education Section, Mrs Yan Li, First Secretary, and Mr Li Xiaopeng, Second Secretary met with academics and students to find out more about City and discuss how to strengthen the links between the University and China. Pro Vice-Chancellor (Internatinal) Professor Stanton Newman and Dean of the Graduate School, Professor Ken Grattan introduced the visitors to City and discussed its place in Higher Education in London. Discussions included City joining the University of London and some of the high profile research that takes place at the University as well as our ambitious strategy for 2016 and 2026. Following this, Pro Vice-Chancellor (Research and Enterprise) Professor John Fothergill discussed City’s five Schools and activities from health to enterprise, mentioning the high prospects for City graduates. The group also discussed City’s historic links with the City of London, particularly the Lord Mayor’s role as Chancellor of City. Professor Roger Crouch, Dean of the School of Mathematics, Computer Science and Engineering then provided an outline of activities and research taking place across this School. During the afternoon the guests met with Professor Marianne Lewis, Dean of Cass Business School, and Dirk Nitzsche, Associate Dean for Internationalisation. During the visit, the Minister said he was impressed with the status of City and suggested ways to increase the profile of the University within China and these include holding summer schools or other short-period collaborative activities with other universities in China. The visitors also met with students studying at City who have been supported by the China Scholarship Council. 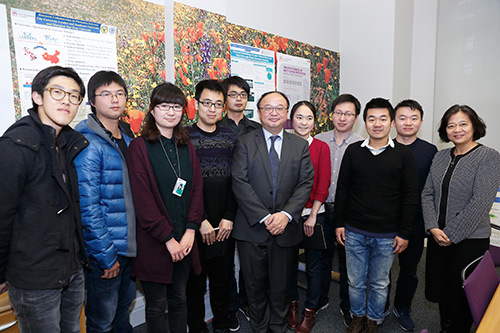 In a speech to the group, Mr Shen encouraged the students to share their positive experiences of City with friends in China in order to further enhance the University’s reputation there. Professor Qingwei Ma, Professor of Hydrodynamics in the School of Mathematics, Computer Science and Engineering helped to organise the visit. The visit gave us a great opportunity to raise awareness of City’s strengths and achievements with our high profile guests. The two Pro Vice-Chancellors and three Deans did a great job of providing an insight into the University and the visitors were impressed by what we are doing and what we will do. The delegation will take what they have heard back to their Chinese colleagues. This will help enhance the reputation of City in China, and so make our University more exposed to Chinese students who are looking to select a place to study.